It’s that time of year when we look forward to the coming of warmer weather and signs of spring. For some, it’s that time of year for the annual IEP review, which you may not be looking forward to. Meeting with school staff, hearing updates on progress and reviewing the written plan can be a daunting process for parents. Here are a few tips to help you navigate through it and be sure your child’s needs are being met. 1. Prior to the meeting, review your child’s progress over the last 6 months to a year. Make notes about skills he’s improved in and what skills need to be addressed. Not sure about skills? Just look at performance and behaviors. Is homework easier to complete, with less crying or frustration? Is her handwriting more legible? Does he seem happier heading off to school or are mornings difficult at home because he doesn’t want to go? Write these things down and bring the list, good and bad, to the meeting. 2. If you notice positive changes and improvements, tell the staff! Parents often head into a school meeting armed and ready to fight for their child’s needs and rightly so. You are going to spend a lot of time at this meeting working on problems. Try to identify an area where your child is doing well and has shown improvements. Educational staff want to hear about your child’s strengths, too. They also want to know when their efforts are working. Notice that a teacher has spent extra time with him to advance reading skills? Tell them you appreciate that effort. 3. If there are many issues on your mind, choose one or two to focus on for this meeting. Sometimes a child’s needs are many. Where to start is overwhelming and it’s difficult to address all the needs at once. It can be more productive to focus on the most crucial need first which can then indirectly address other needs. Look at your list (see #1) and decide which area is of most concern to you. This allows the team to focus on solutions for the problem that will have the greatest impact on you, your child and your family. Issues not addressed at this meeting can be tackled at another time. 4. Take notes or bring a scribe along with you. It’s always important that you write down your understanding of what is agreed on at the meeting. Listen to the reports being presented and make notes of your questions for later. Ask for clarification of actions to be taken or follow up needed and write down the responses. If it is too much for you to take notes while listening and talking, bring along someone who will be able to do that for you. There is always a lot of information offered up at an IEP review, especially if it happens to be a three year re-evaluation. Taking notes means you don’t have to try to remember all that is said and will help you organize your thoughts later. 5. Ask questions, share your ideas. You are a part of your child’s educational team. While it often seems like a room full of people telling you all about your child, the IEP process is a team event and that team includes you, the parent. Your role is not just to receive the information from the staff but to give them information that will help them help your child. By sharing your concerns and helping them understand your child you help the teachers and support staff better meed your child’s needs. By asking questions about school performance you may find a way to do things better at home. 6. Make a connection with one or two members of your child’s team. Sometimes a child’s team may include just a few people but sometimes there are as many as 10 professionals and paraprofessionals supporting your child’s needs. While it is hard to be in regular contact with everyone, you can reach out to one or two people who may have the best connection with your child or who are in a position to help the most. This may be the classroom teacher but may also include the special education case coordinator, the speech therapist, OT or social worker (or other staff member) depending on your child’s needs. As a parent you will have a sense of who connects with your child, that staff person who really understands. Reach out to this person and stay in contact with them after the meeting. They can help you advocate for your child to the whole team. 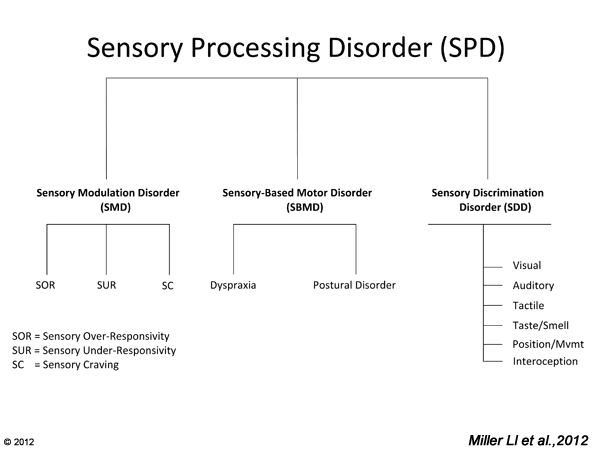 1) Sensory Processing Disorder Foundation: This is the premier research and treatment center founded and directed by Lucy Jane Miller, PhD, OTR. The SPD Foundation and the STAR Center offer cutting edge information and support for parents and children coping with SPD. Explore the latest research, take a webinar or learn more about signs and symptoms of SPD. 2) The Spiral Foundation: Another great research and learning center with a focus on educating the community and advocating for people coping with SPD and its impact on daily life. 3) Raising A Sensory Smart Child: The book authored by Lindsey Biel, OTR/L provides comprehensive information on what SPD is and ways to manage SPD in a variety of settings. 4) Angie Voss, OTR, author of Understanding Your Child’s Sensory Signals, provides resources, tips and information to help with better meeting your child’s needs from a sensory perspective. 5) Sensory Processing Disorder Parent Support website offers a parent’s perspective and lots of tips, strategies and equipment suggestions to guide you through the journey of parenting a child with SPD. While virtual sites and support are wonderful, sometimes we all need a little more face to face support. In response to our community, STEPS for Kids is pleased to announce our new SPD Parent & Caregiver Support Group that will be meeting at our Yorkville clinic on Tuesday October 28, 2014 from 7:30 pm until 9:00 pm. The meeting will be facilitated by STEPS for Kids owner/director, Debra Johnson, MS, OTR/L. The first meeting will be organized around establishing the needs of our community and setting up regular monthly meetings for supporting parents, caregivers, children and families affected by SPD and related conditions. No registration is required for this event but seats are limited. Please call us at 630-552-9890 to reserve your seat today! You can contact our office with questions or sign up for our newsletter to stay informed about events. We hope you can join us for our first Parent & Caregiver Support Group and look forward to seeing both new and familiar faces! STEPS for Kids will be hosting the first Parent & Caregiver Support Group on Tuesday October 28, 2014, from 7:30 pm to 9:00 pm. The group will meet at our clinic in Yorkville and will be a source of support and education for parents and caregivers who are interested in knowing more about SPD and related conditions. Our first meeting will include an overview of SPD and behavioral issues related to sensory disorders. We will take time to get to know one another and gather information to help shape the focus of the group so that it meets the needs of those attending. Facilitated by Debra Johnson, MS, OTR/L, the group will offer an opportunity to connect with others who face similar challenges everyday while learning new skills and strategies to make everyday life easier. This support group is designed for parents, grandparents, extended family members, foster parents/guardians, teachers and daycare providers. All who are interested and invested in the care of a child coping with the impact of sensory processing disorder are invited to attend. The group will be meeting the last Tuesday of each month. We look forward to providing on-going support for our community members. There is no registration required to attend but seats are limited. Please contact the office by phone (630-552-9890) or email to let us know if you are planning on attending so we can reserve a seat for you.